Sarita was already 9 months pregnant when she suddenly began to discharge a large amount of water. Like all village women, she was expecting to give birth at home. Although government hospitals are available, village women do not trust them and stay at home. Hearing about the woman, Urmila, a health worker trained by Amrita SeRVe, managed to bring her to the hospital. Since she was about to give birth any time, the nurse wanted Sarita to stay in the hospital. However, once admitted, she ran away. With no one else to turn to, Urmila managed to get the 9 month pregnant woman to a government hospital 7 kilometers away in Ara. There they operated, removing the dead baby and saving the life of its mother. Grim situations like this do not deter Urmila from her work as the village coordinator and health worker in the 142 household village of Ratanpur, where she holds regular health awareness sessions for women and children and visits homes every day to check up on the health status of the family, personally taking serious health cases to the Primary Health Center (PHC) or hospital. Located in the state of Bihar, Ratanpur was adopted in 2014 by M.A. Math. 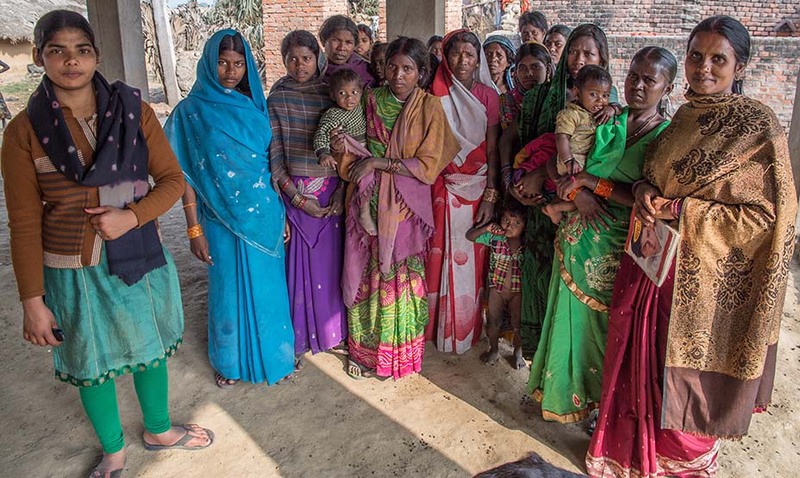 Bihar, one of India’s poorest and largest states, is still haunted by malnutrition and high rates of maternal, neonatal, and infant mortality. From her own village of Hadiyabad, Ratanpur is a one kilometer, but 30 minute, walk through the sun-drenched fields, a far shorter route than the 3 kilometer convoluted road. Mud houses with straw roofs provide shelter to families who sleep outside under the stars during the hotter months. Because they do not own land, the villagers work for 200 – 250 rupees (about 3 U.S. dollars) a day, mostly in seasonal agriculture, block making, or truck loading type of work in the local area. But getting to Ratanpur is no challenge at all as compared to the endless and sometimes fruitless work of nudging people into tiny increments of life-supportive change. 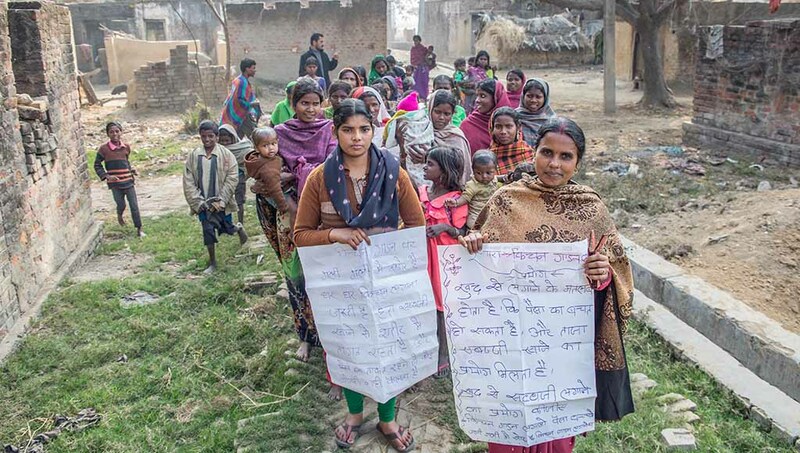 Although many government schemes such as health care systems are available to those living below the poverty line, a lack of trust in the government and health care system has made it challenging for Urmila and village co-coordinator Nand Kishor to convince the villagers to actually avail themselves of services such as the PHC or hospital. It has taken great persistence for Urmila to gradually begin winning the trust of the villagers of Ratanpur, who are far poorer and less educated than those of her own village. She started by bathing the children, who were covered in dust and dirt, every two weeks. As people began to understand and accept her, she was able to bathe them once a week. Over time, they became open to vaccinating their little ones against illnesses with devastating consequences. Then she was able to bring some awareness to pregnant women, who needed to boost their nutritional intake by eating more greens and taking iron tablets as well as showing up for antenatal check-ups. Urmila understands challenge. It is only her persistence and determination, along with a supportive husband, that have enabled her to leap hurdles in her own life. From Bengal, she was one of 5 girls born to parents who milked cows for a small milking enterprise. While still young, her family moved to Ara, in the state of Bihar, where she began school. Urmila liked school. She loved her teachers, who knew so many things. She liked to learn about the world of facts and figures. In the tenth standard, she took the Metric exam. Passing this exam, she knew, would allow her to continue on to higher studies. Continuing her studies, in turn, would help her find a good job, something to do with her life. Maybe she would become a teacher. Maybe a nurse. The possibilities seemed endless to her youthful mind. At the end of the school term, however, her father, anxious to start getting his four daughters settled, found a suitable husband for her. Urmila was still 16 when she found herself married. And by the time the positive results of the Metric exam came, she was already pregnant with her first child. “I passed!” she couldn’t help exclaiming. Folding up the treasured paper carefully, Urmila did not fold up her dreams. For somehow she knew this was not the end, that her dreams had not died, that they would eventually come true. One day in 2014, a strange sight—foreigners wearing white—-some of them with white skin—-caused the people in Urmila’s village to stop what they were doing and run outside to get a closer look. These were people from an ashram, she later learned, some of whom were white foreigners. Everyone stared at them. Later that year, the same people established a tuition center for the children to get extra help with their studies. Greatly interested, Urmila took every opportunity to help these strangers. Though her mother-in-law was not pleased by this—for village women stayed at home, her husband did not restrict her. Having worked in Delhi, he had seen women who worked and were more empowered. This greatly impressed him and affected his attitude towards a woman’s role. The following year, in 2015, some of the villagers went to the Amritapuri ashram. But though Urmila longed to go, her mother-in-law put her foot down, refusing to permit her to join them. It was only a whole year later that her husband was able to convince his mother to allow Urmila to go to Amritapuri to receive Amma’s darsan. In January 2016, Urmila travelled to the Amritapuri ashram, where she had her first darsan with Amma. During this time, she was introduced to the head of Amrita SeRVe, who asked if she would like to get training as a health worker. Urmila’s eyes lit up with delight. And in March 2016, she began her work with Amrita SeRVe. Despite the very trying work that often leads to only small steps of progress, Urmila remains dedicated to her work, committing her life to helping people. This dedication is evidenced not only by village improvements, but in a new, tangible level of awareness and trust, especially among the mothers and expectant mothers. Before Amrita SeRVe started its work in Ratanpur, pregnant women did not consider going to the PHC or hospital for professional medical care. 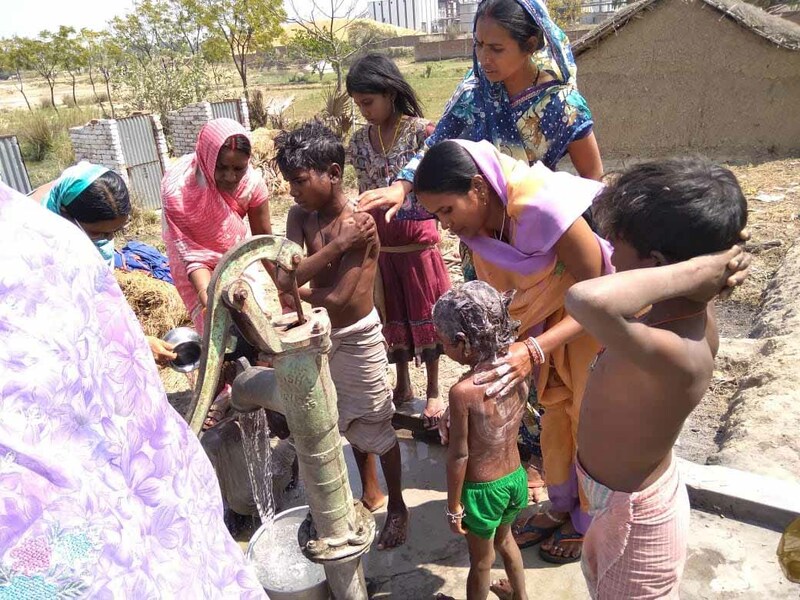 But now that Urmila has slowly but steadily gained the trust of the women, they are availing themselves of this free government service, often saving their own lives as well as the lives of their children. A recent case and testimony to this new foundation of trust is that of Nita Devi, who 4 months into her pregnancy had severe swelling in her feet. Urmila took her to the PHC. After the necessary tests were taken, Urmila told her that if she didn’t take care of herself and eat properly, a more serious condition could result. Nita Devi began following Urmila’s instructions, even asking for the next step in her prenatal care and allowing Urmila to take her for antenatal check-ups at the PHC. Six months later, Nita Devi gave birth to a healthy baby girl. In addition to personally assisting pregnant women, Urmila tracks both pregnant women and child immunizations. Today, due to her persistent health awareness sessions and house visits, mothers understand how crucial it is for their children to be immunized against diseases. To keep track of their children’s immunization schedule, Urmila has taught them to check their cards given by the auxiliary nurse midwife. She also regularly visits the anganwadi (pre-school) to make sure the midday meal provided by the government is actually getting to the children and that supplements such as iron folic tablets are being distributed to pregnant women. In spite of these gains, however, and although the majority of pregnant village women are now aware of how to care for themselves during their pregnancy and avoid unnecessary complications and risks during the birth itself, there are still many who choose not to be involved with the professional health care system.